The match between B68 and NSÍ on Saturday has been postponed because of snow. No new date has been set yet. At the moment, the matches tomorrow are also in doubt. The weather forecast (according to DMI.fo) valid until Monday morning predicts strong wind to strong gale from the north, briefly from northwest, 13-18 m/s, for a time 20 m/s, snow showers, temperatures from just under the freezing point to 2 degrees centigrade. However, at the moment, the weather in Sandur is reportedly ok, so the match between B71 and EB/Streymur is more likely to go ahead, than the others. 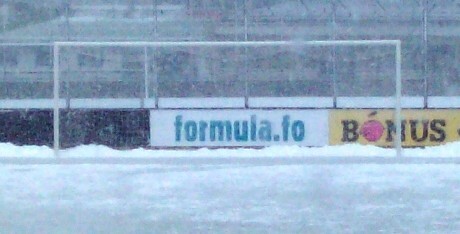 The 3 other matches are B36 – Víkingur, KÍ – HB and ÍF – Skála. Photo above: Hans Pauli Olsen's sculpture (cropped image) was yet again the lonely figure in Gundadalur Stadium in Tórshavn today. All of today's matches have been postponed due to snow. No news yet about when the matches will be played instead, but it will probably be decided tomorrow, Monday. Photo above: Gundadalur Stadium on Saturday. The goal in the background is barely visible. Round 02 rescheduled for April 19th and 20th! The 2nd round matches that were supposed to be played on April 5th and 6th have been rescheduled for April 19th and 20th. That means that round 3 will now be played before round 2, as round 3 will, as originally scheduled, be played on April 11th and 13th. This change also means that the 1st leg of the Cup semi-finals, which was originally scheduled for April 20th, has been brought forward to Wednesday, April 16th. B68 threatened early on when Danish forward Jacob Bymar tested the woodwork before he went out injured later in the 1st half. But overall, NSÍ was the better team and scored twice in connection with corners. Jónhard Frederiksberg headed home after about 20 minutes and Hjalgrím Elttør made the points safe a few minutes before the final whistle. In between, both parties had been guilty of squandering clear-cut opportunities. Although it is early days, and B68 have played against two of the top teams, points aren't influenced by smooth-talk, and B68's points-tally says 0! And that 0 is unlikely to change in the next round when HB visit. But after that, B68 have some crucial make or break-matches against Skála, KÍ, B71 and ÍF. If B68 don't win at least 2 of those, the situation will be looking real grim. HB kept their 100% record, but had to work hard for it, as KÍ were leading at half time. Símun Joensen gave KÍ the lead after 10 minutes in connection with a corner. HB had few efforts in the 1st half that bothered Jákup Mikkelsen in the KÍ-goal, but twice he had to be alert to save from Rasmus Nolsøe and Christian Høgni Jacobsen. HB looked more eager in the 2nd half and started creating more opportunities. And about 12 minutes from the end, the pressure finally paid dividend. Andrew av Fløtum made it 1-1 when he turned in a rebound from a Jákup á Borg freekick, which had struck the post. Five minutes later, HB snatched all 3 points with a goal from right back Mortan úr Hørg. As EB/Streymur could only draw with B71, HB have now opened a 2-point gap at the top of the table. And that gap shouldn't decrease next round when HB visit B68, who still have not made their mark in the table. For KÍ, who also are without a point after 3 games, it will be important to get a result against in-form ÍF next round. If KÍ lose again, they could find it difficult to escape the relegation zone. EB/Streymur took the lead after about 20 minutes with a headed goal from Arnbjørn Hansen. When Sorin Anghel made it 2-0 after an hour's play, B71 looked dead and buried, and when B71's Símin Hansen was sent off shortly after (his 2nd red card in successive matches), nothing suggested a B71-comeback. But B71 hadn't read that script, and first Wellington Soares reduced the score, and a while later, 17-year old Høgni Midjord scored the equalizer for B71. - An incredible fight back. Towards the end, EB/Streymur captain, Egil á Bø was also given march-orders for a 2nd bookable offence. For EB/Streymur, the 2 points lost could prove expensive, and they could fall even further behind in the table next round, when they visit B36 who are defending well. EB/Streymur will be without suspended central defender Egil á Bø. For B71, in the bottom, every point is a valuable one, and they'll be optimistic ahead of next week's match against Skála. Dave Jones' flying start as ÍF-coach continued, as his troops won the 6-point match against Skála. Hungarian Sinko Balazs headed in the goal a quarter of an hour into the 2nd half. Two clean sheets in a row is without doubt boosting ÍF's confidence, and they will surely be thinking that they can win their third match in succession when KÍ visit next Sunday. B36 took the lead halfway into the 1st half when a long cross ended in front of an unmarked Bergur Midjord at the far post, and he had the easiest of tasks putting B36 in front. Karoly Potemkin should have double the lead for B36 with a free header before halftime, but although he has the ability to be in the right place at the right time, he too often needs 3 chances to score 1 goal. The play throughout the match was of very poor standard, and especially Víkingur were uninspiring. But then, halfway through the 2nd half, almost out of nothing, Andreas Lava Olsen equalized for Víkingur with a cracking shot from 25 metres. But the joy was short-lived, because within 5 minutes, B36 went in front again. Víkingur's goalkeeper, Geza Turi, should have done better with Johan Ellingsgaards's long range effort, but he gave an unnecessary rebound which B36's new Nigerian forward, Patrick Sunday Okoro (who had just come on), was quick to take advantage of, and with his first touch of the ball he made it a great Sunday for B36. The much changed B36-side from last year has started the season very well, but next Sunday they face their stiffest test in the league so far, when they take on EB/Streymur. Víkingur didn't impress much today, and especially their defence, made out of big and heavy men, looks slow and vulnerable.